From Gizmodo, March 20, 2019: The Proton Improvement Plan II, formally approved by the Department of Energy last summer, includes plans for the highest-energy linear particle accelerator to accelerate a continuous stream of protons — a central component to the American particle physics laboratory. Fermilab PIP-II Project Director Lia Merminga is quoted in this article. From University of Chicago news, March 15, 2019: Fermilab officially broke ground March 15 on a major new particle accelerator project that will power cutting-edge physics experiments for many decades to come. The new 700-foot-long linear accelerator, part of the laboratory’s Proton Improvement Plan II, will be the first accelerator project built in the United States with significant contributions from international partners. From Space Daily, March 19, 2019: A major new physics facility at Fermilab is expected to have UK technology at its heart and lead to significant spin-off opportunities for UK companies. The new PIP-II particle accelerator will power the Deep Underground Neutrino Experiment, which aims to address key questions about the origins and structure of the universe. The UK has committed a 65 million-pound investment to help build and operate DUNE, PIP-II and technology for the neutrino beam. From MeteoWeb, March 18, 2019: Si è tenuta il 15 marzo al Fermilab, negli Stati Uniti, la cerimonia di posa della prima pietra di uno dei più importanti progetti per il futuro della fisica, in cui l’Italia porta un contributo tecnologico e scientifico di primo piano. Si tratta del progetto PIP-II per la realizzazione di un nuovo acceleratore lineare superconduttore, lungo 215 metri: una delle macchine più avanzate per la ricerca in fisica fondamentale che avrà il compito di produrre il fascio di neutrini di alta energia più potente del mondo per il progetto DUNE. From Kane Country Chronicle, March 15, 2019: Fermilab broke ground on a major new particle accelerator project on March 15 that will power cutting-edge physics experiments for many years to come. The new 700-foot-long linear accelerator, part of the laboratory’s Proton Improvement Plan II, will be the first such project built in the United States with significant contributions from international partners. From UK Research & Innovation news, March 15, 2019: A major new physics facility at Fermilab is expected to have UK technology at its heart and lead to significant spin-off opportunities for UK companies. The new PIP-II particle accelerator will power the Deep Underground Neutrino Experiment, which aims to address key questions about the origins and structure of the universe. The UK has committed £65 million investment to help build and operate DUNE, PIP-II and technology for the neutrino beam. 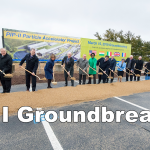 From Aurora Beacon-News, March 15, 2019: Fermilab broke ground on a project that takes it into the future as one of the world’s premier particle physics laboratories. From Daily Herald, March 15, 2019: The ongoing attempt to fully understand our universe — how it started, what it’s made of, why it sticks together — is getting a new tool: a powerful linear particle accelerator at Fermilab. Officials on Friday broke ground for the Proton Improvement Project-II, which officials said will power cutting-edge physics experiments for decades.